Like the squeak of a mouse, it is high and soft. In the darkness of the room, I lay on my mattress on the floor, trying to associate the noise with something familiar. Again, the sound - a little bit peep, a little whimper, a little whine. I realize it is Arayo and reach to stroke her - moving my hand from the silky rich texture of her fur to the bald skin of her lower side and hip. The area my cousin calls "the turkey leg" because it looks so like the side of a freshly plucked Thanksgiving bird. For the moment she calms, though when I roll over to go back to sleep, the whining continues. 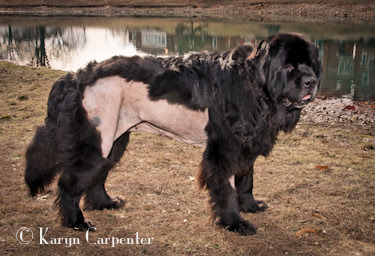 It is so unlike her - she is a Newfoundland, noted for being stoic through pain. "Oh, what the hell", I think, and reach for her medications. She had a pain pill 3 hours ago, but if she is complaining, I'll give her another one. She's been split from breastbone to her privates. 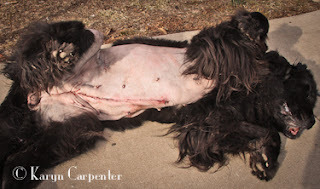 62 staples hold her organs in place, another 5 secure a port which will be used later to inflate a band wrapped around the neck of her bladder. Continent only with the use of massive amounts of drugs, a band has been affixed to the neck of her bladder and will later be inflated - the goal to keep urine where it belongs until she elects to discharge it. But that is all for later. Now, we work through the slow healing process. With another pill ingested, Arayo gradually calms and I sleep, only to wake again to find her whimpering yet anew. I don't think I can give her another pill so I wrap my arm around her and allow her to climb onto the mattress and curl next to my shoulder. It is I who love her most, yet it is I who have caused this misery she now suffers. My job is to protect her, yet I've brought this into her life. Until I know she's fully healed and that this was the right decision, Arayo and I each suffer our own special agony. Dear dear Arayo, and dear dear Karyn--all we should ever do in our life with our life, is the best we can for ourselves and those we love and care for. Karyn, you've done so!! When there's been a major assault on the body (read that surgery), it takes time for healing to take place and that healing hurts. Thank goodness for pain killers! I trust that Arayo's healing will be complete and in a short time (1, 2, or 3 weeks????) she'll be as good as new, or even better! Take care, and keep loving her. Poor bubby! Here's hoping for a speedy and uncomplicated recovery! The road to recovery might be full of whimpery nights for you and Arayo but how comforting to know that her human will always love her the most. Furry or bald, healthy or healing you will hold her in the physical and emotional sense. She will always have a shoulder to lay her big head on and you will have a fur coat to run your fingers through. Although you share a little pain and misery now a healthy future will be realized soon.